The concept of lesion sterilization and tissue repair (LSTR) therapy has been developed by the Cariology Research Unit of the Niigata University School of Dentistry which utilizes the use of a mixture of antibacterial drugs for disinfection of dentinal, pulpal, and periapical lesions of teeth. Healing of damaged tissues is likely to happen if disinfection of lesions takes place. Due to polymicrobial nature of infected root canal, a single antibiotic is not sufficient for disinfection of root canal. Hence, a combination of antibacterial drugs is used. Selection of antibacterial drugs has been done on the basis of various studies related to bacterial isolation from oral sites, including endodontic lesions of primary teeth. Metronidazole has become the primary preference in the combination as it has a wide bactericidal spectrum against anaerobes which commonly occur in oral sites. Ciprofloxacin and minocycline are added to it to eliminate the other bacteria which are resistant to metronidazole. This triple antibiotic paste is biocompatible as metronidazole and ciprofloxacin have been proven to generate fibroblasts, and tetracycline is effective in inhibiting collagenases and matrix metalloproteinases. In primary teeth, the complexity of the root canal anatomy is well known. Thorough mechanical debridement cannot be carried out always due to the thin, flared-out roots. Use of caustic chemicals and chelating agents remains controversial. Presence of resorbing roots stresses on the careful use of irrigants to avoid excessive penetration of irrigants in the periapical tissues. All these factors raise a doubt of complete disinfection of root canal system of primary teeth. Few studies have reported the successful use of LSTR in primary teeth with periradicular lesions.,, It has also been proposed as an alternative to routine pulpectomies in uncooperative children and in canals which are nonnegotiable. The following report of three cases highlights the successful use of LSTR for nonvital and vital pulp therapy in primary teeth of uncooperative children with periradicular pathosis and internal root resorption. Commercially available ciprofloxacin (200 mg), metronidazole (400 mg), and minocycline (100 mg) were used. The preparation was done similar to the procedure mentioned by Takushige et al. The enteric coating was removed and the drugs were pulverized and kept separately in airtight containers. The powdered drugs were mixed in a ratio of 1:3:3. The drug mixture was then mixed with propylene glycol or canal sealer, producing a paste-like consistency. A clinical and radiographic examination was carried out in all the three patients who reported to the Department of Paedodontics and Preventive Dentistry of our institution with their respective complaints. A clinical diagnosis was arrived at. The teeth were anesthetized and access opening was done. The coronal and accessible radicular pulp was extirpated. The canal orifices were enlarged with a round bur to create medication receptacles. Pulp chamber was irrigated using saline and 1% sodium hypochlorite solution. The medication receptacles and the pulpal floor were covered with triple antibiotic paste. The access cavity was then restored with resin-modified glass ionomer cement. A 7-year-old female with a noncontributory history reported with a chief complaint of pain in the lower left back tooth region for 4 days. Pain was spontaneous and aggravated on eating food and at night. Clinical examination revealed a large carious lesion on the occlusal surface of the primary mandibular left second molar extending over to the lingual surface. The tooth exhibited normal physiologic mobility but was tender on percussion. Periapical radiograph [Figure 1]a revealed coronal radiolucency involving the enamel, dentine, pulp, and presence of internal resorption in the mesial root of the primary left mandibular second molar. Furcal radiolucency overlying the underlying succedaneous tooth was evident. The tooth was diagnosed with chronic irreversible pulpitis. Pulpectomy was attempted in the first appointment. Access opening followed by extirpation of coronal and radicular pulps was carried out. However, persistent hemorrhage was evident from the mesial canals, which was possibly due to the presence of internal resorption. The clinical procedure of LSTR was then carried out after the bleeding was controlled following irrigation with sodium hypochlorite and saline. The patient was asymptomatic when she returned for a 1-month follow-up visit. Radiograph from the 1-month follow-up visit is depicted in [Figure 1]b. The tooth exhibited reduced mobility and was nontender on percussion. At the 6-month follow-up visit, the patient continued to be asymptomatic. 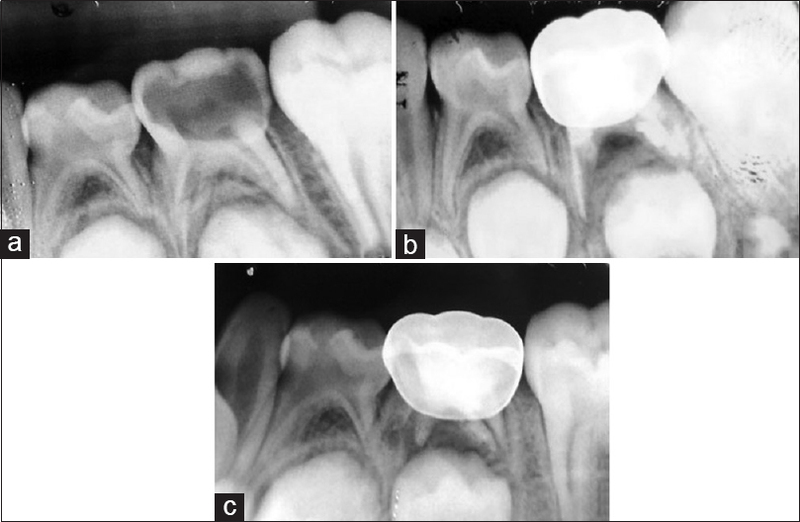 Radiograph from the 6-month follow-up [Figure 1]c revealed reversal of internal resorption, absence of any furcal radiolucency, and presence of normal physiologic root resorption. A 6-year-old female presented with a chief complaint of pain in the upper right back tooth region for 1 week. The pain was spontaneous in nature and aggravated on chewing food. The patient had undergone dental treatment 1 year back. Medical history was insignificant. Clinical examination revealed a large restoration and secondary caries involving the occlusal surface of the upper right primary first molar which also exhibited Grade I mobility. Presence of deep dentinal caries was evident in the upper right second primary molar. Both the primary molars were tender on percussion. The patient exhibited negative behavior during the examination. A periapical radiograph [Figure 2]a revealed coronal radiopacity extending to the canal orifices of the pulp chamber of the upper right first primary molar suggestive of pulpotomy-treated tooth, with evident of internal resorption in the mesial root. Furcal radiolucency was also noted. Upper right second primary molar exhibited coronal radiolucency involving enamel and dentine and approaching the pulp and presence of slight furcal radiolucency. Based on clinical and radiographic findings, the teeth were diagnosed with pulpal necrosis with furcal abscess of the upper right primary first molar and chronic irreversible pulpitis of the upper right primary second molar. Pulpectomy was carried out in the upper right second primary molar. For the first primary molar, the clinical procedure of LSTR was carried out following the removal of the restorative material. At the 1-week follow-up, the LSTR-treated tooth exhibited normal physiologic mobility and was nontender on percussion. 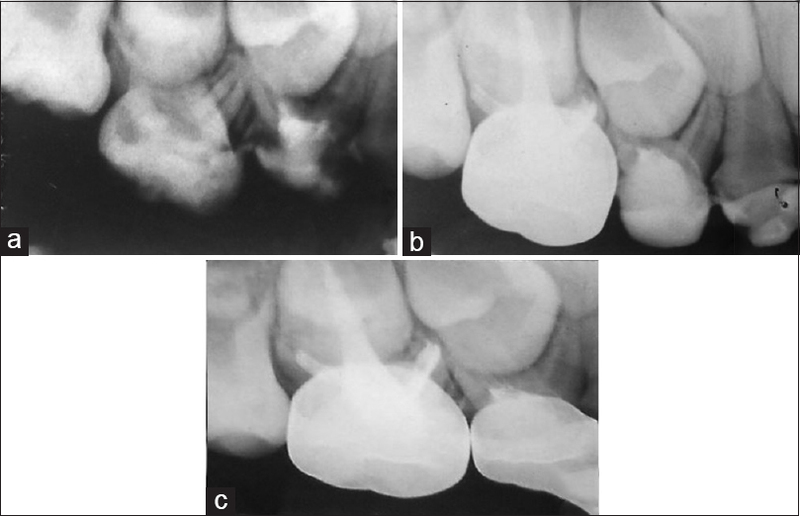 Radiographs at the 3-month [Figure 2]b and 6-month [Figure 2]c follow-up visit revealed absence of any furcal radiolucency and reversal of internal resorption. A 5 ½-year-old female with a noncontributory history reported with a chief complaint of pain and swelling in the lower right back tooth region for 1 week. Extraoral examination revealed a diffused facial swelling on the right side of the face. Intraorally, a vestibular abscess adjacent to the carious primary mandibular right second molar was seen. The tooth exhibited Grade I mobility and was tender on percussion. Periapical radiograph [Figure 3]a revealed coronal radiolucency involving the enamel, dentine, pulp, and presence of internal resorption in the distal root of the primary right mandibular second molar. Gross bone alterations and furcal radiolucency were evident. The tooth was diagnosed with a necrotic pulp and chronic periapical abscess. Access opening followed by extirpation of coronal pulp was carried out in the first appointment and an open dressing was given. The patient was prescribed a course of systemic antibiotics. At the second appointment, which was scheduled after 2 days, persistent hemorrhage was evident from the distal canal following extirpation of the accessible radicular pulp, possibly due to the presence of internal resorption. The clinical procedure of LSTR was then carried out after the bleeding was controlled following irrigation with sodium hypochlorite and saline. The patient was asymptomatic when she returned for a 1-month follow-up visit. The tooth was nontender on percussion with absence of mobility. 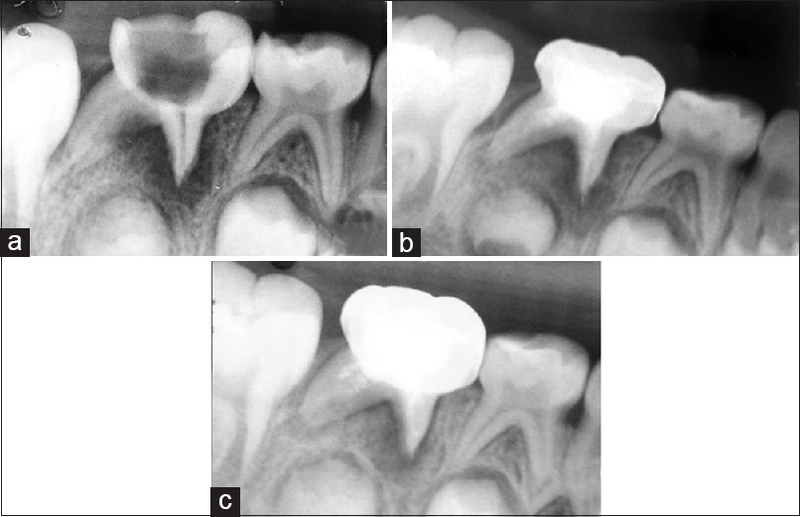 Radiograph at the 1-month [Figure 3]b and 3-month [Figure 3]c follow-up visit revealed reversal of internal resorption in the distal root and reduced furcal and periradicular radiolucency. The results of the LSTR therapy carried out in the above three cases appear encouraging and support the clinical findings of other studies.,, The LSTR therapy can be selected as an excellent alternative to extractions and pulpectomies for nonvital primary teeth. However, drug history forms an important part in this regard. LSTR should be avoided if a history of allergy to any of the antibiotics is reported by the patient. In our three cases, the patients had a noncontributory medical history and no side effects were encountered on topical application of the triple antibiotic paste. Evidence of successful clinical results of LSTR therapy in the treatment of infected primary teeth is present in the literature. The success can be attributed to the bactericidal efficacy provided by the triple antibiotic mixture. The drug combination comprises a nitroimidazole compound that is metronidazole which is effective against anaerobes and protozoa. Ciprofloxacin is a synthetic fluoroquinolone and bactericidal to Gram-negative organisms. Minocycline, a semisynthetic derivative of tetracycline, exhibits a broad-spectrum activity and is effective against both Gram-positive and Gram-negative organisms. To the best of our knowledge, no research has been accomplished to see the effectiveness of the LSTR therapy on primary teeth exhibiting internal resorption. This case report highlights the success of LSTR therapy on primary teeth where reversal of internal resorption was evident in the radiographic examination in the follow-up visits. Tetracycline causes inhibition of collagenases and matrix metalloproteinases  and increase in the level of interleukin-10, which is an anti-inflammatory cytokine. In addition, it has been proved that metronidazole and ciprofloxacin can generate fibroblasts. Chmilewsky et al' s. study revealed fibroblasts of the human pulp as the first nonimmune cell type capable of producing all complement proteins. These fibroblast cells play a significant role in tissue regeneration by involving pulp progenitors via complement activation, which throws light on the probable reparative procedure of targeting pulp fibroblasts in dentin–pulp regeneration. Therefore, the triple antibiotic paste which has been proved to be biocompatible can be used in primary teeth exhibiting internal resorption. The future of LSTR therapy in pediatric dentistry seems to be optimistic. In young uncooperative children, extraction can be avoided and LSTR therapy can be opted for, making the dental treatment nontraumatic. Future research involving long-term follow-up is warranted in this regard. But certainly, LSTR has the credential to be a promising therapy in the treatment of primary molars exhibiting gross periradicular pathosis and internal resorption. Anila B, Murali H, Cheranjeevi H, Kapil RS. Lesion sterilization and tissue repair (LSTR): A review. J Sci Dent 2014;4:49-55. Burrus D, Barbeau L, Hodgson B. Treatment of abscessed primary molars utilizing lesion sterilization and tissue repair: Literature review and report of three cases. Pediatr Dent 2014;36:240-4. Soory M. A role for non-antimicrobial actions of tetracyclines in combating oxidative stress in periodontal and metabolic diseases: A literature review. Open Dent J 2008;2:5-12. Ramamurthy NS, Rifkin BR, Greenwald RA, Xu JW, Liu Y, Turner G, et al. Inhibition of matrix metalloproteinase-mediated periodontal bone loss in rats: A comparison of 6 chemically modified tetracyclines. J Periodontol 2002;73:726-34. Chmilewsky F, Jeanneau C, Laurent P, About I. Pulp fibroblasts synthesize functional complement proteins involved in initiating dentin-pulp regeneration. Am J Pathol 2014;184:1991-2000.